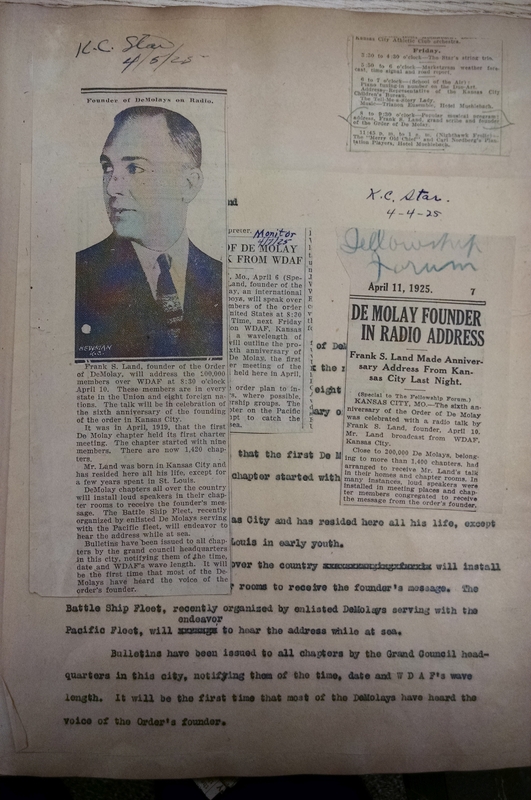 On Friday, April 10, 1925, F. Scott Fitzgerald published “The Great Gatsby.” But on that same day, the DeMolay world was more greatly affected, and in fact, astounded to meet its Founder up close and personal, as “Dad” Frank S. Land took to the radio airwaves to address the members of his Order all across the country. We don’t think of that as being very spectacular, today, but in 1925, it was a high tech experience! Consider this: the very first radio broadcast happened sometime in 1920. Generally it is credited to KDKA in Pittsburgh on November 2, 1920. Who did these pioneer stations broadcast to? Hobbyists, mostly, who were building their own crystal radios. Crystal radios didn’t need electricity to pick up a middle frequency radio signal, but they couldn’t amplify the signal, either, so owners had to listen with headsets. Very few families owned a radio in 1920, and in 1921 there were less than 40 stations broadcasting anything across the country on the AM band. By the middle of 1922, however, the “radio craze” had begun and there were hundreds of individual stations broadcasting local programs. Families saved their money to make a major purchase--$75 (or equivalent to $978 in 2018)— for a radio console with a tuning dial and a speaker that everyone could hear. And they would gather every night to see what they could find on the radio. The local station in Kansas City was WDAF—affiliated with the Kansas City Star newspaper where “Dad” Frank Marshall worked. A program for the night was printed in the local paper, but if they “surfed” the radio waves, they could find strong signals from as far away as Hawaii, and London. Likewise, WDAF was one of the strongest stations and could broadcast to all 48 states. But only the locals knew what was on the program for the evening. This was before radio stations were organized into networks—that wouldn’t happen for another year, and by 1927, NBC had two national networks, CBS had one, and the Mutual Broadcasting System became the fourth. With a national network, the best local programs could be relayed across the country by the strongest stations, and national schedules could be published. When it was announced that “Dad” Land would be broadcasting between 8 and 9:30 PM on a Friday night, it was an accepted format that it would be done in conjunction with a popular music concert, where the orchestra would play a 5 minute song, and the guest would be interviewed for a similar time period, alternating for that hour and a half broadcast. G.B. Sykes, the Grand Council’s Director of Publicity, put out a notification to every DeMolay Chapter Advisor telling them to tune into the broadcast signal at 365.6 meters (820khz). Back then, radio signals were referred to in meters, but hertz designations soon took precedence. The station’s strength was 500 watts, and within 6 months it had doubled to 1,000 watts! There were 1420 Chapters of DeMolay at that time, in all 48 states, and this was an amazing opportunity to reach all of the Order in one evening, including those DeMolays in the Battle Ship Fleet deployed in the Pacific Ocean! Unfortunately, we have no idea what “Dad” Land said that night, but you can imagine the pressure he must have felt to say exactly the right thing to EVERY DeMOLAY in the world, if they chose to listen. Below you can read the notification letter, and see some newspaper clippings, laid on top of the original press release announcing the broadcast. Hearing Dad Land’s voice was something that most DeMolays never thought would happen for them, unless they happened to be at a Conclave where he was visiting. Can you think of anything you have experienced that might have had a similar impact on you? Radio waves travel farther at night—that’s a science question that some of your brothers might be able to explain to you—but the stronger stations could overpower weaker stations and blast their programs for thousands of miles. Have any of you experienced this, even today, listening to AM radio in the evening? Does ANYONE still listen to AM radio? The rapid growth of radio as a communications system in the United States and around the world is paralleled by our more recent explosion of another communications tool where coverage and signal strength is still of vital concern. Can you identify this, and does that help you understand how radio grew so rapidly in the 1920’s? This past June, the International DeMolay Congress arranged for its elections and some of its meetings to be simulcast via the internet, so that DeMolays around the world could share in the proceedings. Did any of you watch this? If you could watch the Rededication Ceremony at the site of Jacque DeMolay’s execution by burning in Paris, France on March 18th of next year, would you be interested in tuning in? 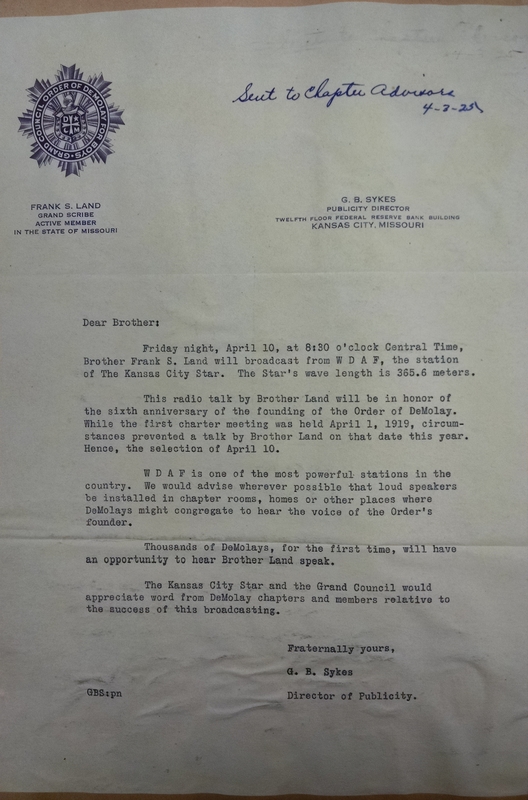 How about the 100th Anniversary Celebration in June from Kansas City?